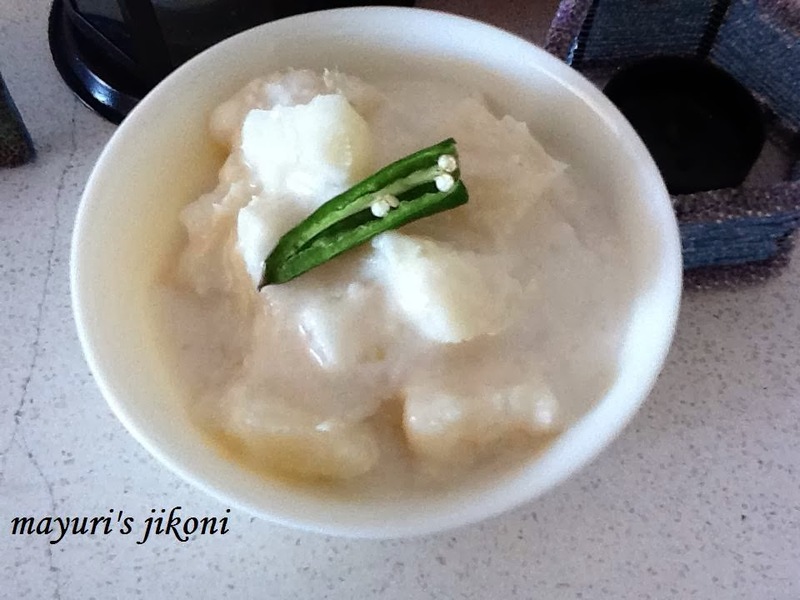 Cassava in coconut milk is a famous Kenyan coastal dish and very easy to prepare. Tui varo mogo, mogo na nazi, are some of the common names used. Mogo is cassava and nazi is coconut. In the Gujarati language tui is coconut milk. Kenyan coastal dishes over the years have acquired both Arabic and Indian influence. Cassava is widely used at the coast as a main dish because it is widely grown at the coast, is cheap and full of carbohydrates. This dish does not need many ingredients. The cassava has to be fresh and not stringy. As I have mentioned previously I really don’t know how to choose good cassava. I totally depend on Julius our house help to do that for me. Most say that the cassava harvested during the rainy season is not good. Cassava from different parts of the world is different so follow your instincts. Normally, if your cut off the tip the inside should appear milky white. Cassava cooked in coconut milk is like a meal on its own. Some have it for breakfast, some with mamri or along with a meat dish. I usually like to prepare this dish on Ekadashi day as its a filling meal. Tastes delicious on its own or with some farari chevdo or mogo crisps. Grate the coconut. Put the grated coconut in a liquidizer with 1-1½ cups of water. Process it. Put the mixture in a sieve and squeeze out the milk. Now you have the thick coconut milk. Keep that on the side till required. Put the coconut back in the blender. Add 2 cups of water and process again. Put the mixture in the sieve and squeeze out the milk. This is the thin coconut milk. Peel, wash and cut cassava into chunks. Put the cassava pieces in a large pan or a pressure cooker. Add the thin milk, salt, chilli and ginger and cook till done over medium heat. If you are using the pressure cooker, 2 whistles is usually enough. If you are cooking in a pan, cover the pan and cook over low heat till done. Let the cassava cool down a bit. Add the thick milk, mix well and heat it up and serve. If you don’t want to use fresh coconut then use canned or packet coconut milk to cook the cassava and then add coconut cream. If you are cooking the cassava in a pan, you may need to add about ½ cup more water. Love mogo, never tried withcoconut milk.